Perhaps you've noticed I'm on a bit of a short story bender this Spring - the following collections are the latest in my binge, short stories of the very best kind - the raw, revealing and riveting kind; the kind that make you hold your breath; the kind that make you notice all the subtle beauty and sadness; the kind that make you think dang, I wish I could write like that. Claire Vaye Watkins takes us to the Nevada desert in her debut collection, and her stories are as stark and devastating as you might imagine the landscape. From the opening story, a fictionalized version of the author's own origins in the world, these stories grab hold and don't let go. We witness a poignant series of letters to an unknown recipient, guilt and misdirected love at a bunny ranch, the sudden affection of an isolated older man for an abused young woman he shelters, the profound and unexpected bond between a depressed young woman and her newly discovered pregnancy. The characters are conflicted - wounded and jaded, yet so deeply desiring love and connection; Watkins' writing is sharp, perfect, precise... just... wow. 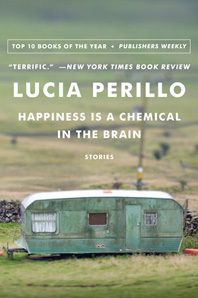 In Lucia Perillo's stealthy stories, the characters may not be solitary, but they are often alone within their relationships, in their interpretions or observations of the world, or perhaps keeping a secret. One woman knows she's dying and throws herself a party ("House of Grass"), another woman believes - or maybe just needs to believe - her husband is having an affair ("Happiness", perhaps my favorite), a mother is at odds with her husband in the parenting of a struggling teenager; a middle aged man grieves not only his father's passing but the absence of a proper relationship with him. Perillo's stories are elegant and quietly moving. This is an older collection, stumbled upon while searching for the author's latest novel, the Women's Prize for Fiction (formerly Orange Prize for Fiction and becoming the Bailey's Prize for Fiction) -winning May We Be Forgiven, and now I must go read everything A.M. Homes has ever written. I loved so many stories in this gripping collection I almost don't know where to start, but they capture everything loving and tender and painful about relationships - marriages good and bad, children and parents, aging parents and unwell spouses. The collection closes with the memorable "The Former First Lady and the Football Hero," an extremely insightful, poignant and bittersweet fictional portrayal of Nancy Reagan caring for her husband in the late stages of Alzheimer's. My thanks to W.W. Norton for a complimentary review copy of Happiness is a Chemical in the Brain. Things You Should Know is from the public library, and Battleborn is my personal copy. I don't know the books, but I definitely understand your thinking. And I like the quote you included. These are new to me too. But like Charlie I get you. What I do is I try to imagine how I would've approached a book anytime I read one. If it is very good, I ask if there is any other way to have written it. An interesting exercise! I often admire in awe & often try to dissect how it was done, but I think I only re-envision with books that I thought didn't completely work. I've not read these, or many short stories really, but this has tempted me - the first especially.